Creating a profitable and successful business is both challenging and exciting – you need to have a clear brand vision with a firm understanding of the product you’re creating, marketing and selling. Sarah, Director of Geo Heaven has found her niche. 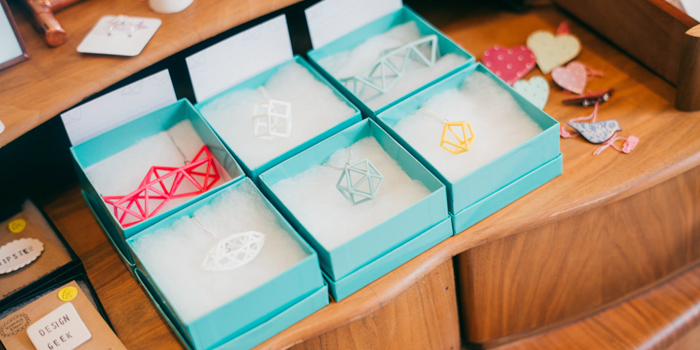 She creates beautifully unique, 3D printed, geometric jewellery. Whilst the idea of geometric design may not be new, the process of 3D printing is. In the space of 4 months, Sarah has created a product, branded her business and is now selling her products online and in stores. We caught up with Sarah to find out how she got her unique, 6-11 business off the ground. Why did you decide to start creating jewellery? I knew for quite a few years that I wanted to set up my own jewellery company – I work in education and that wasn’t really filling my creative needs. I had lots of ideas but I felt as though each one I was coming up with wasn’t original and unique enough. I was driving home from the midlands last year, and suddenly decided I wanted to make 3D printed jewellery, I knew what I wanted it to look like and what I wanted to call the company – it was a definite lightbulb moment. Take us through your creative process – how did you get to the final product? I knew I wanted to make geometric jewellery and I knew I wanted to 3D print it. People are drawn to geometric shapes because they occur naturally within nature, with this in mind, I knew that I could make something timeless. As I was 3D printing, I wanted to create 3D structures. I loved the wire frame look of the structures and the shadows they created, which is where my first collection came from. I create all of the designs using a CAD computer package – my husband is a computer programmer, he taught me how to use the CAD package, allowing me to bring the designs I had in my head, to life. There’s a lot of maths involved to create perfect symmetry. After I created the initial prototypes I began exploring dyeing techniques, ultimately bringing me to the products we have now. How do you prioritise your time, running your 6-11 alongside your 9-5? It’s difficult having a full time job as well as running a business – I’d love for my 6-11 to become my 9-5. Most evenings are spent working on the jewellery and I schedule and prioritise my time accordingly. I might be out with friends for dinner and receive some orders. Once I’m home I’ll stay up putting those orders together so that they can be fulfilled the following day. As long as you’re committed, you can do it. How did you build your branding and why do you feel it’s important for your branding and products to work cohesively together? I spent a lot of time behind the scenes deciding on the brand vision. I knew that when I launched I wanted to have a very clear and cohesive brand and I’d received a lot of advice on the importance of having a strong brand identity. I wanted to have the word “geometric” in the brand name, hence Geo Heaven. My branding was designed by my friend Steph who runs a company called Donut Press – she’s a creative genius. I put a mood board together of things that had inspired me, Steph looked at this and created the branding from there. I think it’s really important for your branding to represent the product as it helps people to invest in the brand. I put lots of thought into the colour pallet – all of the colours in the branding also feature across my jewellery range. I believe that you have to invest a lot of time and effort into branding if you want to be taken seriously. I initially had a go at creating my own logo and it didn’t relate to the product whatsoever. I’m so glad that I outsourced to a designer who lives and breaths branding. 3D printing is still a relatively new medium. How do you market your product and overcome people’s objections and suspicions of 3D printing? A lot of people don’t understand the process of 3D printing at the moment. There’s loads of 3D printers that you can buy and keep at home but they have an inkjet nozzle with a filament, which means the printed layers are thick and not very good for jewellery as they don’t have a smooth finish. I use a process called laser contouring – there’s a bed of nylon powder, which lasers are fired at fusing the nylon together as it hardens. I’ve got a large section on my website about the process and techniques used in making the jewellery. I also include an information slip in the boxes explaining the process to help customers understand what’s gone into that particular piece that they’ve just bought. It makes them truly appreciate it. What inspires your jewellery range? I’m inspired by every shape I see, whether it be 2D or 3D, a drawing on a piece of paper or a building on a street. This collection was definitely inspired by a trip to Krakow in Poland. We went to MOCAK, the modern art museum. There was this bright red, gigantic geometric structure that you could walk around, which I think sparked my idea for Geo Heaven. What are you doing to build and promote your brand, and how do you use MOO’s range of products to support you with this? I advertise through social media primarily, promoting my website and stockists through Facebook, Instagram and Twitter. It’s working really well for me – it’s actually how some of my stockists initially approached me. Each of my stockists have some of my Luxe Business Cards which they’ll hand out to people – everybody comments on the quality of the business cards as well as the coloured edge. I also use Stickers to brand plain bags, and wrapping. I even pop a sticker onto the Jiffy bag when I post out the jewellery – I love the idea of my customers being hit with the brand as soon as they get the parcel. What are your tips for aspiring jewellers looking to develop their hobby into a 6-11 business? Take your brand seriously – understand your brand identity and vision. If you don’t, others won’t either. Social media is powerful, particularly for small indie businesses – it’s an amazing platform. You should put a lot of thought into how you want your feeds to look so that they’re cohesive. For example, I like to use a concrete background in all of my product shots. People spend around 4 seconds on your feed before deciding if they want to follow your or not, so you’ve got to grab their attention! Lastly, invest in quality when it comes to marketing and promoting your brand. As I mentioned, I use the Luxe Business Cards – they aren’t the cheapest cards, but they’re called “Luxe” for a reason – you get what you pay for – they really reflect my brand and I always get complimented on them! The next collection is going to explore the properties and layers you can get by using 3D printing, so printing something within something! Watch this space!